I always find myself going back to Doom every so often. Any Doom really, including the fantastic new entry, even Doom 3 if it's heavily modded with old school-tinted maps in tow. Although Catacomb 3-D was my first real "grown-up shooter," Doom really solidified the formula and made me a life-long fan with its sprawling level designs. 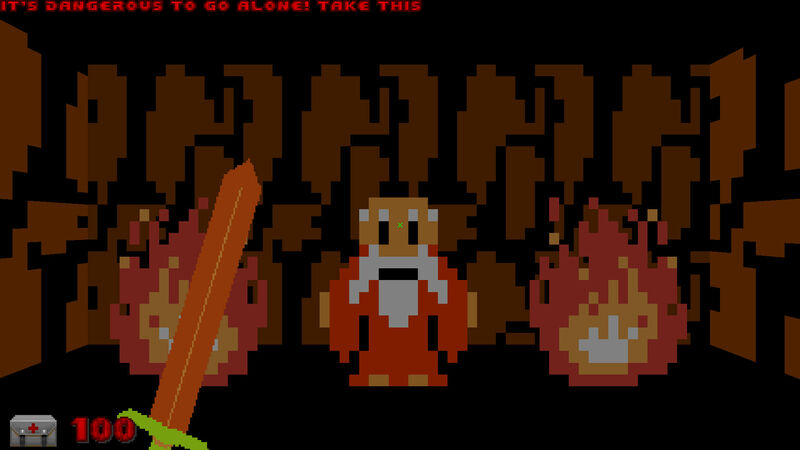 That's why I'm immediately down to clown around with this Legend of Zelda: Total Conversion mod for Doom, which essentially morphs the original NES game into a first-person 8-bit dungeon crawler. It's unfinished at the moment, but the modder is hoping that through the kindness of strangers, it can be completed. This absolutely isn't the first time someone has delved into the realm of NES-era Doom mods, but the screenshots on the mod page really got me. Initially pitched as a "silly idea" between friends the mod is now live and playable with "a copy of the 'DOOM.WAD' file shipped with the original/ultimate version of the Doom game."